Andy: Wow, this is an EXTREMELLY sweet rum. It has a very strong coconut flavor with a hint of pineapple. It is sweet and smooth going down. This is a great rum for the base of any tropical drink or try it with Coke and a lime for a fruity twist on a Cubre Libre. Nice and sweet just like me! 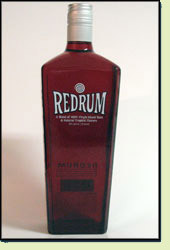 Adrian: Redrum is a very sweet rum. I would not consider it a good rum for a rum and Coke though, but would be a great inclusion in a tropical drink. At 70 proof it still packs a nice punch.